Pond Press, 2008. 80 pp., 65 color illustrations., 9¾x9¾". These photographs document the American cultural landscape and, in particular, the intersection of the commercial world and the desire of Americans to express their singularity. This book is for photography lovers, collectors of Americana, architecture fans, and travelers. It is an Americana road trip in a book. Almost Paradise embraces the American culture with aff ection and celebrates the character of the American people. Tirelessly traveling the United States, David Graham captures the colorful, sometimes surreal, and often bizarre in the thoroughly American landscape. Graham seeks out subjects that celebrate our singular freedom of expression in colorful roadside attractions and general oddities. 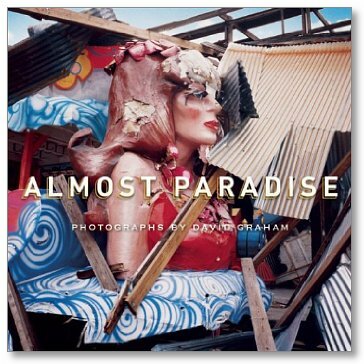 Chronicling the American scene with his unique sensibility and acknowledging popular forms of American photography—the snapshot, the family portrait, and vacation pictures—Graham brings relevance to the creativity and dreams of the common man. David Graham is an important contemporary photographer. His previous publications include American Beauty, Only in America, The Christmas List, and Alone Together. His photographs are included in the collections of the Museum of Modern Art, the Philadelphia Museum of Art, the Art Institute of Chicago, and the San Francisco Museum of Modern Art, as well as international collections. He photographs for The New York Times Magazine, TIME, Newsweek, Forbes, Fortune, and Details, among others. Associated exhibitions of this work are scheduled through 2008 and 2009 in New York City, Philadelphia, Chicago, and Los Angeles.